Create magnetic business cards with your inkjet printer. Only Avery offers so many FREE easy-to-use design and print solutions. Coated to produce sharp text and vibrant color. Precut for removal; no scissors required. 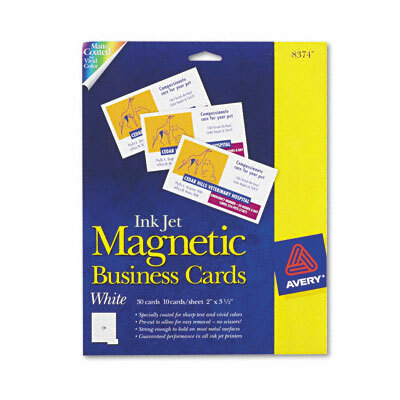 Make your message really stick—create magnetic business cards with your inkjet printer. The magnetic backing has a matte coating on front to produce sharp text and vibrant color. Plus, only Avery, a Microsoft® Gold Certified Partner, offers so many FREE easy-to-use design and print solutions. Precut for easy separation; no scissors required. Each card: 3 1/2 x 2.